George Bures Miller‘s Simple Experiments in Aerodynamicsseries are less propositions for actual scientific experiments and more points of departure, preparatory works that represent and inform the sentiments of surprise, daring and crisis that accompany the experimental and subsequent experiential process. The mixed media sculptures are spare, ambiguous works that shirk the responsibility scientific experiments have to acknowledge proof, through the reproduction of quantitative results. Two works, one at either end of the gallery, sit not quite facing one another. Experiment #1includes a metal rack holding a video monitor aloft and a rear projection scrim connected to the raised monitor, extending to the right. 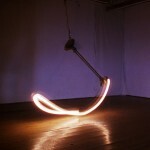 Below, a dim light bulb swings, propelled by an electrical pulse upon the wiring. The video shows a hand gently waving; its mirror image appears synchronously in the rear projection. Together they make a very odd winged creature. At times, the video-wings wave hesitantly. Sometimes they appear lively and confident. They feel the air, as though through familiarity alone flight will occur. The trajectory of the swinging light suspended from the rack throws thin spider-legged shadows upon the walls. 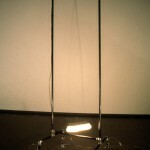 The oscillating shadows of the apparatus create an eerie sensation of movement, igniting a slight decentred or off-balanced feeling in the spectator. With the suspended, swaying light bulb casting spindly shadows, the video hand-wings look like a caged bird perched on a swing. I am less interested in how the sculptures may or may not illustrate aspects of Bures Miller’s alleged experiments in movement / stillness and am more impressed by the effects they generate. In his sculptures Bures Miller heightens the constants of loss, uncertainty and potential enlightenment. These elements have a particularly frigid and unnerving presence and it is precisely this presence that is my concern here. Imbalance .4 features a simple metal rack approximately eight feet tall standing near the middle of the 12, cubed room. Between two vertical support bars a light bulb hangs from the end of an electrical cord. The low wattage light bulb hangs just above the base of the rack, resting 12 inches or so from the floor of the small, dimly lit room. The stand, which resembles a clothing rack is about 4 feet wide. It has been altered so that its footings are loose and flexible, as if sitting inside aluminum boots. The rack’s feet are connected by a maze of translucent hoses to an industrial air compressor hidden behind a wall. A computer program monitors the compressor, regulating the amount of air sent out through each tube, one to each of the rack’s four legs. In an alternating pattern of hissing and snapping, the hoses transport sharp doses of compressed air causing the legs to quickly lift, momentarily hold and then depress again, eventually sending the cord and light bulb along a wobbly trajectory swinging back and forth between the vertical rods of the rack. The light bulb is jerked back and forth at an ever increasing rate, its arc path driven to greater lengths by the mechanically produced bursts of air. 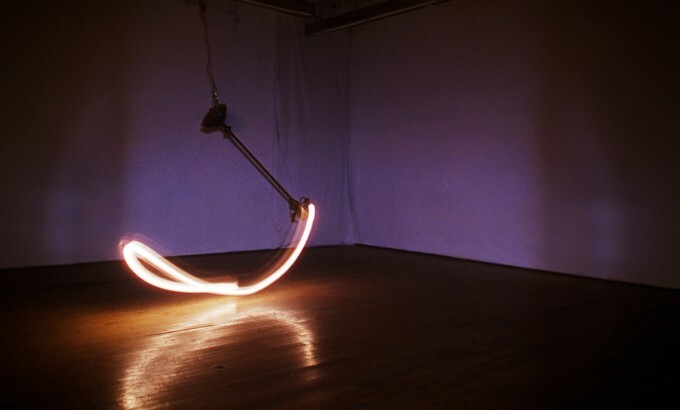 The light bulb jumps dangerously close to the walls and the gallery viewers who are forced to consider their proximity to the swinging light and menacing shadows. Just before the light bulb appears to graze the eye lashes of the viewers in the compacted space, the computer shuts down the compressor and the light bulb and cable is left swinging in near silence, the menacing shadows slowly receding against the walls, floors and ceilings, mesmerizing the eye. The disengaged bulb and cord eventually end up inert and lifeless until some minutes later the process begins again. As an artist, Bures Miller is an interpreter, understanding the dynamic nature of intermedia work as a whole. The work is decidedly technical and logical. Bures Miller’s work begins with organizing and cataloguing materials. The crucial process takes papers, notes, drawings, video footage and other documents out of the category of the unstructured and raw and gives them an intellectual framework to come to terms with language and preconceptions of the unique exchange that is, in the end, the infrastructure for the experiential process. The resulting visual experience and residual images are neither mechanical nor passive, less involved with describing the perceptual world than concerned with reorganizing it and building a basis for multiple interpretations or possibilities. A sense of potential and imminent danger are front and center as the sculptures appear, at least initially, uncontrollable, apparently, beyond the quasi-scientific control of the artist. One is conscious of the artist’s presence and his role in maintaining knowledge, order and clarity amidst faux chaos. The experiential in the intermedia work of Bures Miller is built on the interpretation and production of loss, loneliness and uncertainty. The experiments above are occasionally tinged with fear. This is partly achieved through Miller’s creation of an agitated state in the viewer. Just as intermedia works in general may leverage dynamic change by occupying spaces between media, the visceral, experiential elements common to the Imbalance series occupy similar spaces between panic and euphoria, between terror and self-confidence ÜÜ the flip flopping of sentiments commonly associated with experiencing a state of imbalance in a darkened room. 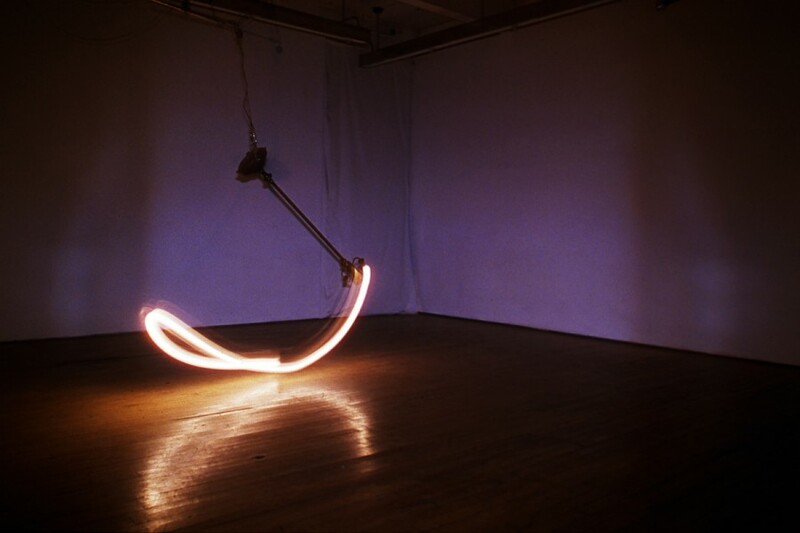 For example, Imbalance .3features a simple three-bulb lighting system, a stubby chandelier without ornamentation, that follows a 33 foot track of cable (its length is variable; its placement in the room more critical). The lighting unit runs back and forth along the cable at a rapid rate until suddenly, at seemingly irregular intervals, the unit stops abruptly on its cable track. The three-bulb chandelier swings back and forth erratically for several seconds before coming to rest, then suddenly it lurches again, swinging from one end of the cable track to the other. What could be implied in the stark glare of the light and its passage through this dimly lit space? The sustained tension in the piece can be traced to filmic sources that constantly shift and pull a sense of the present moment from the past and the future. “STOP THE PROJECTOR. CUT THE CURRENT. EXTINGUISH THE PROJECTION LAMP. THE MAGUS PROCLAIMS: TIME MUST HAVE A STOP. What is the Present? It is nothing more than a point upon the line of Time, where the infinite Future is separated from the infinite Past.” 2 The effects of jumping shadows and a menacing cacophony of sound along a defined line of jerky movements and pauses (or derailments of reason) triggering a reminder of the present — isn’t that what Alfred Hitchcock and Orson Welles gave us in abundance? Bures Miller’s ongoing interest in science fiction’s stock-in-trade of futuristic, bizarre phenomena also provides some insight. Bures Miller spends countless hours ordering and providing for the physical well-being of the experiments with an intimate knowledge of the fragmentary and deceptive nature of his evidence. As in a filmic experience, the agitated state of the viewer is a prerequisite and Bures Miller replicates the conditions for this experience in the semi-darkness of a white cube. What is demanded is not the calm of a quiet room to elicit contemplation, but the sensory experience of the best dramatic film whose juxtaposing of visual cues and sound in a semi-dark room can become a calculated interstice between sustained tension and psychic paradigm shift. If some residue of the filmic experience informs the work of George Bures Miller it is a particular sensibility unconcerned with mainstream dramatic film’s linear narrative structure and moreso, aligned with the limitless potential in the genre of science fiction with its shattered narratives, special effects and the critical evisceration of progress. What Bures Miller so effectively mines is the experiential, further stripping it down and transferring its residue to new intermedia sculptural forms. Bures Miller’s experiments in aerodynamics have less to do with formal experiments in engineering or science that aim to quantify and reproduce the certainty of results and more to do with replicating the experiential that doggedly avoids explanation as easily as it enlightens. 1 Alcand, Charles. 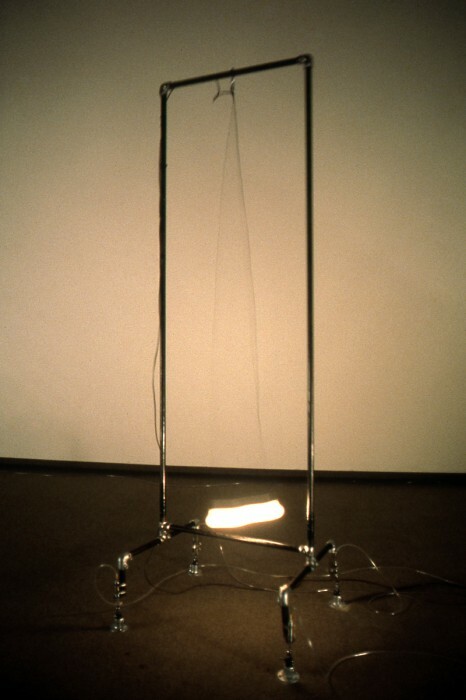 “On the Dynamics of Post-Industrial Cultural Relations.”George Bures Miller’s Simple Experiments in Aerodynamics, (Lethbridge: Southern Alberta Art Gallery, 1995), pp. 7Ü9. 2 Anger, Kenneth. Time Must Have A Stop. Vienna: Six Pack Film, 1995.